How to Tune an Acoustic Guitar. The pitch that a guitar string produces is extremely sensitive to changes in the environment, especially when using multiple tunings. A guitar must be tuned at least once before every playing session and more often with hard, aggressive playing. Tune an acoustic guitar to itself. 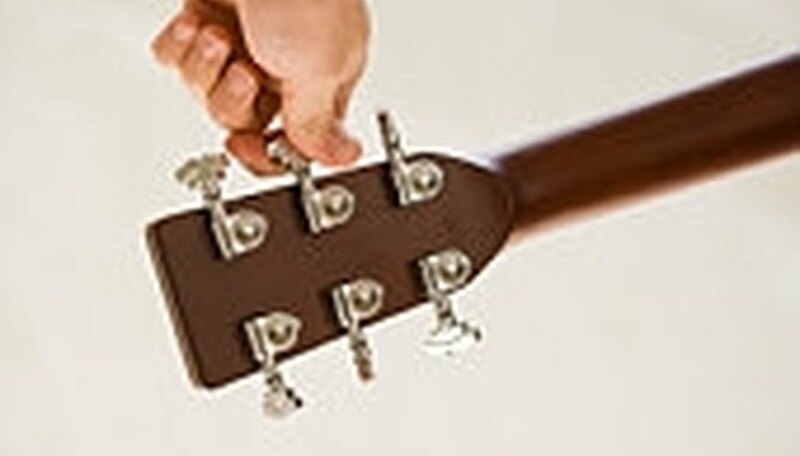 This method was commonly used before tuners were widely available and simply assumes that a string (usually the highest) is already in tune. Each string is fretted at the location that should produce the same pitch as the next highest string when unfretted. Use the method given in Step 1 to tune a guitar to the standard EADGBE tuning. We assume that the high E string is already tuned correctly. Tune the B string so it has the same pitch at the fifth fret as the open E string does. Repeat this process for the rest of the strings being sure to use the fourth fret when tuning the G string to the open B string. Employ a basic battery-powered tuner. This type of tuner is specifically designed for a particular guitar tuning sequence (usually EADGBE). Turn the tuner on and place it as close as possible to the sound hole. Play each open string in turn and tune the string until the indicator shows the string is in tune. Obtain a chromatic tuner for alternate tunings. These tuners can tune to every note in the chromatic scale and do not require the guitar to use a specific tuning. Play the harmonic at the 12th fret for increased accuracy in tuning. You can obtain a pure tone that is one octave above the fundamental note by plucking the open string while a finger is resting lightly against it. What Are the Notes for Guitar Strings?